New Year’s Eve is the perfect time to release the past with every fiber of you body so you can make room in your heart and mind to receive the gift that is the present. TWO CLASSES, THE CHOICE IS YOURS…. With this practice that moves from gentle to strong, physically let go of stress and disappointments and make room for balance, focus, lightness. 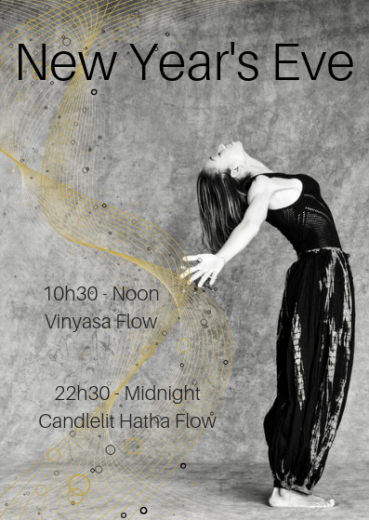 With each movement and breath, do a mental cleanse and feel your intention for your practice and the new year take root. Slowly, gently explore a sequence of asanas designed to open your heart and mind, and all the corners of your body where tension may be lingering. Play with different poses to discover flexibility, strength, and maybe even a new perspective for the new year. Through a guided meditation, drift into deep relaxation that allows your body to rest while your mind gently explores sensations, emotions, and layers of your consciousness, establishing a connection with your inner most self. The result is a feeling of bliss and a stronger awareness of your sankalpa, a deeply personal intention, a heart felt desire aligned with your truest nature. Take this time to find a sankalpa that will guide you into 2019.